Geneva, 20 April 2018 (IOM)* – IOM, the UN Migration Agency, reports that 18,575 migrants and refugees entered Europe by sea through the first 108 days of 2018, with about 40 per cent arriving in Italy and the remainder divided between Greece (38 per cent) and Spain, at roughly 20 per cent. This compares with 43,645 arrivals across the region through the same period last year, and 205,613 at this time in 2016. In comparative terms, then, current arrivals are running at 42 per cent of last year’s pace, and at just over 9 per cent of 2016’s. Much of this drop can be explained by changes in the Central Mediterranean route linking North Africa to Italy, where IOM – citing Italian Ministry of Interior figures – reports 7,541 migrants have arrived through 18 April, which is approximately 20 per cent of last year’s total during the same period. The 1,245 arrivals to Italy so far this month are fewer than those arriving in Greece (which had 2,207 through 17 April) although considerably ahead of Spain (with 409). This decline reflects the sharp drop in departures from Libya, which this month are at under a fourth of levels from last April, and about a third of those of 2016 (see chart below). In the Central Mediterranean IOM Libya’s Christine Petré shared an update on rescue/interception activity along Libya’s coastline for the month of March. IOM Libya reported 1,058 men, women and children were brought in from thwarted smuggling vessels during the month of March, bringing to 3,479 the total for the first three months of 2018, an increase of more than three times over January 2017 activity (see chart below). IOM Libya this week also reported IOM has assisted 5,775 migrants to return to their countries from Libya since 1 January 2018, and over 12,000 since the scaler up of returns started after 28 November 2017. On Tuesday IOM assisted 155 migrants to return home to Gambia on one chartered flight. With this latest flight on Tuesday IOM now has returned a total of 25,145 men, women and children from 30 different countries, since 1 January 2017. IOM Greece’s Kelly Namia reported Thursday that over three days (15-17 April) the Hellenic Coast Guard reported at least three incidents requiring search and rescue operations off the island of Lesvos and Chios. The Coast Guard rescued 95 migrants and transferred them to those islands. Namia reported that another 222 migrants landed during these same days on Farmakonisi and Kos – as well as others landing at Chios and Lesvos who did not require rescue – bringing to 7,209 the total number of men, women and children arriving in Greece by sea since 1 January. That’s an average of just over 66 persons per day. 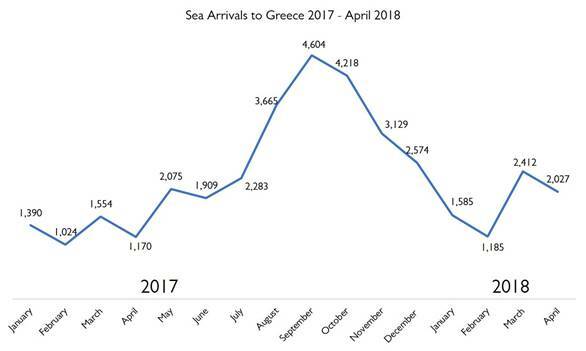 April 2018 is shaping up to be Greece’s busiest month since last September (2017), when 4,604 irregular migrants came to Greece by sea, one of only four months migrant arrivals have topped 3,000 on any given month since January 2017. Last September, daily arrivals of these migrants averaged 153, which is slightly above the 119 daily arrivals’ average this month. Nonetheless, April surely will be the busiest month of this year so far, having already surpassed arrival numbers for January and February and coming very close to those of the full month of March (see chart below). IOM Spain’s Ana Dodevska reported that total arrivals at sea in 2018 have reached 3,778 men, women and children who have been rescued in Western Mediterranean waters through 18 April, including 409 reaching Spain during this month. This figure compares with 3,226 through the first full months of 2017. An additional 1,822 have also arrived by land, chiefly at Spain’s two enclaves in northern Africa (see chart below). Worldwide, IOM’s Missing Migrants Project (MMP) has recorded 942 deaths and disappearances during migration in 2018. There were three additions to the MMP database since last Monday’s update (see chart below). On the Pakistan-Iran border, two young Pakistani men died when attempting to cross into Iran near Gwadar, Balochistan on 12 April. On the US-Mexico border, where 67 migrants are estimated to have died this year, on 17 April the remains of a male migrants were recovered from the Rodhe canal, near the International Bridge Reynosa-Mission in Tamaulipas, Mexico. Also on 17 April, in Nuevo León, Mexico, the remains of a 45-year-old man were found near train tracks in Montemorelos. Of the 23 deaths recorded by the Missing Migrants Project in Central America and Southern Mexico in 2018, 10 were due to train accidents. *SOURCE: IOM — UN Migration Agency. Go to ORIGINAL.